‘An acknowledgement by Cedeo allows you to choose the best education from the large pool of providers,’ reads the Cedeo website, a renowned independent Dutch certification institute. Business School Netherlands again lives up to the expectations by achieving – for the tenth time in a row – a customer satisfaction level of 85% in the MBA category! 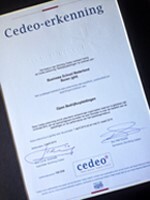 The Cedeo certificate can be compared with an acknowledgment by the nationwide consumers department. “We treasure every acknowledgement that comes from an independent institution, including the one Cedeo has awarded us. Especially when you realise that only 1 in every 10 institution is actually given this certificate – and BSN has been awarded the acknowledgement already ten times in a row – it should be considered an achievement to be very proud of,” smiles Hamstra. For more information on our Action Learning MBA and Management Programmes, send an email to international@bsn.eu. Stay up-to-date and follow us on Facebook, Twitter and LinkedIn. Or subscribe to our digital newsletter.